Eight-year-old Francie Waggit loves helping animals. And what’s more helpful than adopting a homeless dog? But like her dad says, caring for a pet takes time and money, and the Waggit family can’t spare much of either. 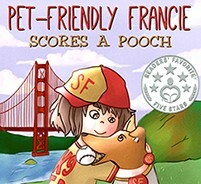 Then a bright, friendly stray named Scrimmy literally leaps into Francie’s life at a San Francisco 49ers game, and Dad reluctantly agrees to give the pooch a tryout. Scrimmy loves his new pack, but his loyalty keeps landing the Waggits in one bind after another. Can Francie find a way to keep Scrimmy on the Waggit team? 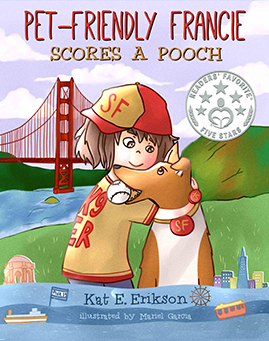 Or will she have to give up her best furry friend forever?